c application which are characterized by large problem spaces have to resort to dedicated infrastructures based on clusters, clouds or desktop computers. Such applications can benefit from a vast computing resource that hitherto has been overseen and left untapped, the Internet browser. The Idea of using a simple desktop as a computing platform is not new, volunteer computing has for a decade managed to gather an unprecedented computing power to help solve, in 2011, the aggregated computing power provided by the participants in all projects using BOINC (Berkeley Open Infrastructure for Network Computing) comes to over 5.2 PetaFlops, with 2.2 million registered users, where 280,000 are active users. The research work we are developing here, is a much simpler and user friendly way to achieve volunteer computing using recent advances in technology and the Web 2.0 approach. ffer the possibility to visiting users to contribute to computing thus the Web can evolve from a mere content network to a truly computing platform. The remarkable advances in browser technology specifically the introduction of HTML5. Amongst of many other features, HTML5 introduces the notion of a web workers which are basically threads within the browser that have the sole scope of performing data intensive computing without disrupting the users’ experience of the webpage. t from processing on Internet browsers equipped with underlying GPU hardware. Figure 1: Social media plays a crucial part in garner web browser computing resources. Social media also mediates the trust between the user and the clients asked to join the network. 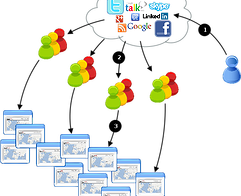 In (1) a user with a distributed application uses social media to get colleagues and friends (2) to join the network by simply sharing a URL. Clients navigate to the URL (3) and start computing in the browser. Developing new methods to tackle challenges and bottlenecks identified in the existing proof of concept on different aspects namely: scalability, performance, and security. Scalability: To truly cater for millions of users we need a scalable backend with possibly multiple servers for distributing workloads to browsers. Servers need to be setup to share job queues so as to balance the load on the clusters of browsers. Thus each server is responsible for a cluster of computing browsers. Performance: With WebCL, next generation of browsers can compute directly on GPUs thus drastically increasing scientific computing performance for the class of applications that are targeted for GPUs. Our preliminary results show that WebCL is as fast as OpenCL, which was expected. A scientific application or experiment is often composed of several tasks, which together form a workflow. A workflow describes how tasks depend on each other, often through data. To make a distributed computing platform attractive to science, the backend should handle workflow execution, which means piping data from one job to the next and delaying scheduling of tasks until input data is available.